Neural networks have emerged as a successful tool to solve end-to-end classification problems, potentially applicable in many diagnostic settings once trained with a sufficient number of existing annotations. Nevertheless, in such training it is often nontrivial to enter already available domain knowledge. We herein propose a simple approach of inputing any such information as additional layers to a network. This may then yield better performance by allowing for networks with fewer parameters that can be tuned with fewer annotations and with better generalization capabilities. This can also allow for interpretability of a deep network, by quantifying attribution to such additional inputs. We study this approach for the task of skin lesion classification, where we focus on prior knowledge in the form of pigment networks as they are known visual indicators of certain skin lesions, e.g. melanoma. 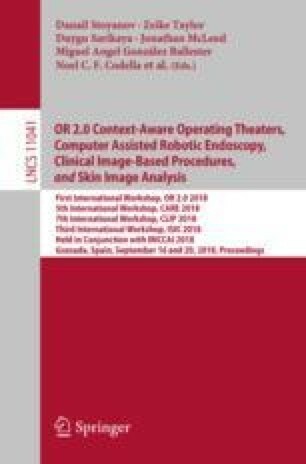 We used a public dataset of dermoscopic images, where a low number of feature segmentations and a high number of classifications are provided in disjoint datasets. By including information from learned pigment network segmentations, the recall for malignant melanoma was seen to increase from 0.213 to 0.4. To help interpret the results, we also quantified the “attention” to pigment networks paid by the deep classifier both location- and channel-wise. Support was provided by IBM Research Zurich, Switzerland and the Promedica Foundation, Chur, Switzerland.